Connect with Your Smartphone, Tablet, Laptop, Computer, etc. Read the reviews… Our competitor’s cameras IP cameras have lousy software. There is often an involved setup including logging into your home internet wifi router to setup. Remote access requires setting up a DDNS server. Even worse, some cameras don’t even have the ability to upgrade the firmware! Say hello to SereneLife’s unique “Managed Account” solution that takes care of all the complex network stuff and enjoy a SUPER SIMPLE user experience. IPCAMHD82 can be used along side any other SereneLife cam with a single account for iPhone Android or desktop to monitor live and recorded video. 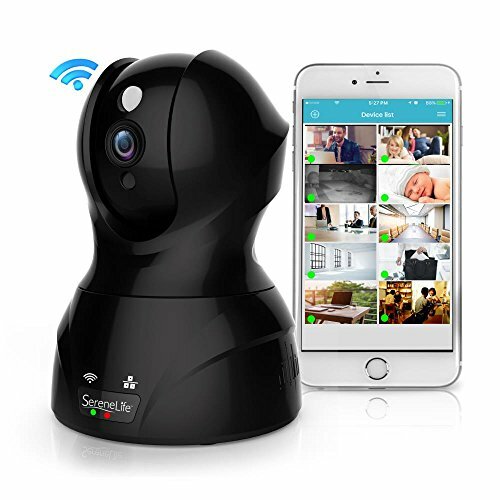 The wireless security camera delivers FULL HD 1080p video and all the features you would expect from a top of the line home security camera! Add up to a 64g SD micro card to your camera to get recording right away - or upgrade your system by adding the Serenelife “Cloud Box” and get up to 2TB of video storage (6 weeks of recorded video). This Serenelife camera is covered by a 1 year manufacturer's warranty!